Starting now until the 14th of December we encourage you to visit our office and donate a present. Drop off hours are from 9-4, Monday -Friday. 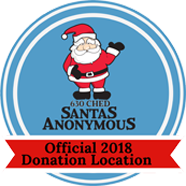 We will deliver all donations received to the Santas Anonymous depot.